When Cancun first became popular, beaches were the main draw. They were then, as they are now, some of the nicest beaches on the planet. However, now that Cancun has grown up, it has added many different elements for your enjoyment! And the beaches, yep, they're still there, and they're still free! Golfers looking for action will enjoy several good golf courses, both near Cancun and south along the coast. 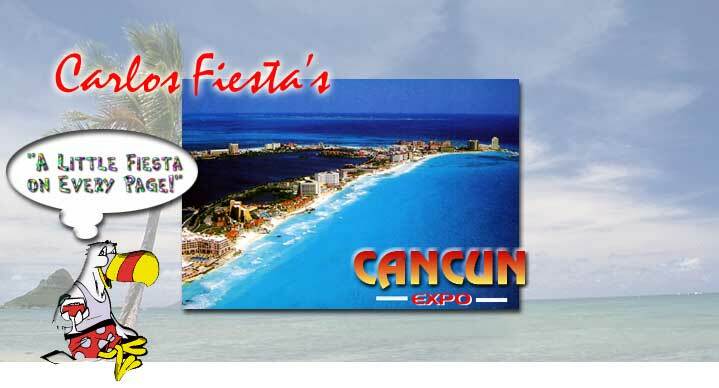 For more information visit the GOLFING section of Cancun Expo. Fishermen have been enjoying "tight lines" in Cancun for years now. Drop by the FISHING section of Cancun Expo for more information. Some of the fun in Cancun comes from just walking around the main tourist areas. The area near the Convention Center near the north east section of Cancun Island offers a host of entertaining options. Bring money! Don't forget! Half the fun in Cancun happens at night. Visit our NIGHTLIFE section for more optons from dusk 'til dawn! And for more "fun stuff" to do in Cancun, including snorkeling, diving and much more check out the RECREATION section of Cancun Expo! Telephone 011-52 (998) 885-1682 * 011-52 (998) 885-3260. Located off of Kukulcan Boulevard at km. 16.5 at the Royal Plaza Marina in the Hotel Zone. All kinds of water sports fun, good for a few hours or all day! Located on Kukulcan Boulevard at km. 6.25 in the Hotel Zone. Fishing, snorkeling, water skiing, jungle tour and more! Located on Kukulcan Boulevard at Km. 15.2. Snorkeling, scuba diving, submarine tours, jungle tours, catamarans, paddle boats, wave runners, water skiing, windsurfing, kayaks and much more! Telephone 011-52 (998) 883-0199 extension 193 or 194. Located in the Cancun Convention center on Kukulcan Boulevard at km. 9.5 in the Hotel Zone. A production of Mexico's traditional dances and culture. Nightly shows. Buffet dinner show also available. Located 20 miles south of Cancun in Puerto Morelos. Plant farm, gum camp, Mayan ruin and an exhibition of regional flora. Hundreds of species identified. Bring bug repellent! Located at the Cancun Plaza de Toros Bullring. Bullfights plus additional Mexican traditions every Wednesday at 3:30 P.M. Ole! Telephone 011-52 (998) 885-2288 * Fax 011-52 (998) 885-2299. Located on Kukulcan Boulevard at Km. 15.2, opposite the Melia Cancun Hotel, between the Marriott and the Fiesta Americana Condesa in the hotel zone. The only paddle steamer in Mexico. Scenic cruises through the mangroves of the Nichupte Lagoon with a three course dinner. Live band, dancing and games on the top deck! Telephone 011-52 (998) 883-1488 * 011-52 (998) 883-3283. Located Kukulcan Boulevard at Km. 16.5, in front of the Omni Hotel. Lobster or steak dinners aboard the galleon 'Columbis' on the calm lagoon. Includes open bar! Telephone 011-52 (998) 983-0779 * 011-52 (998) 983-0780. Located on Isla Mujeres, 7 miles east of Cancun. Swim with the dolphins in the beautiful waters of the Caribbean! Safe and fun, and available to anyone who can swim. Minimum age 12 years old, 8 years old with adult supervision). Each session is one hour long, including 30 minutes of swim time and photo opportunities. Departures from Playa Langosta Pier. Isla Mujeres all-inclusive adventure cruise. A full day, first class tour to Isla Mujeres. Breakfast, open bar, snorkeling, shopping, and seaside lunch. Watch dolphins interact with people. Sail and snorkel tours from Cancun to Isla Mujeres, plus romantic sunset sailing adventures! Located on Kukulcan Boulevard at km. 14.1 next to Mango Tango Restaurant. Drive your own small boat on an exciting jungle cruise through the mangroves in the lagoon. Stop at Punta Nizuc for swimming and snorkeling. Miniature golfing in style! 2 courses 18 holes each, through mini-jungle complete with waterfalls. Open from 11:00 a.m. to 11:00 p.m. Located in the Hotel Zone in the Marina next to Carlos and Charlie's. The best way to see the underwater wonders of Cancun! 45 minutes of awesome scenery! Located on Kukulcan Boulevard in the Convention center, in the Hotel Zone. This museum houses Mayan artifacts and tells a story about the everyday life of the Mayan Indians. Open from 10:00 a.m. to 2:00 p.m.
Telephone 011-52 (998) 883-3552 * 011-52 (998) 883-2119. Located at El Embarcadero on Playa Tortugas. Morning and afternoon semi-submarine tours of Cancun's coastline. Located off of Kukulcan Boulevard at km. 15.2 in front of the Hotel Melia Cancun. Spend a day snorkeling and sunbathing at Punta Nizuc National Park, just south of Cancun. Your day includes boat tour, lunch, refreshments, snorkel equipment and instructions. Departures from Playa Langosta, next to Casa Maya Hotel. 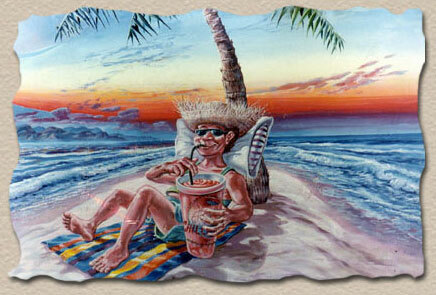 Wild and crazy night on a Caribbean island pirate village. Dress as a pirate, gorge on a massive buffet and open bar, join the show and boogie and gamble with the crew for gifts and prizes! Lagoon tours in a feisty environment, matey! Plaza Marina, Local 32, Zona Marina Federal Sur, Playa del Carmen, Quintana Roo, 77710. Located one hour south of Cancun in Play del Carmen. Jumping out of a perfectly good airplane....what a concept! Fully trained and licensed jumpmasters by the United States Parachute Association. Video and still photography available. Low bounce record. Telephone 011-52 (998) 883-2169 * 011-52 (998) 883-3767. Located on Kukulcan Boulevard at km. 3.5 at the Marina Carrousel Hotel in the Hotel Zone. Fly over Cancun's beaches is an inflatable boat attached to a hang glider! Life insurance not included. Located on Kukulcan Boulevard at Km. 15.2 between the Marriott Hotel and the Fiesta Americana Condesa, in Aqua World. Submarine rides into the clear water! See living coral neon parrotfish, angelfish, and sometimes rays, turtles, and dolphins. Optional snorkel tours. All major credit cards accepted hourly departures from 9:00 a.m. to 3 p.m. Located on Kukulcan Boulevard at Km. 25, south of the Hotel Zone. Almost 800 feet of beautiful ocean front playground, plus acres of slides, chutes, flumes, floats and plunges. Take the whole family for a waterpark wonderland! Restaurants, bars and gift shops, lockers and showers available. Also snorkel, dive, and jungle tours. Credit cards accepted. Telephone 011-52 (998) 883-3144 * 011-52 (998) 883-3143. Located 46 miles (74 km.) south of Cancun at the large well-marked entrance. Xcaret is a natural theme park, complete with a large lagoon, underground river, and acres of surrounding jungle. Things to do include snorkeling, swimming with dolphins, horseback riding, museum, art gallery, amphitheater, restaurants and much more! Telephone / Fax 011-52 (998) 884-9422. Office address: Nader 28-3, Cancun, C.P>, Quintana Roo, Mexico, 77500. Located 76 miles (122 km.) south of Cancun at the well-market sign, at km. 240 on the Cancun-Chetumal Highway. Xel-Ha is a multitude of jungle, paths, waterways and crystal clear lagoons and cenotes. A fun place to enjoy lunch and a snorkel! Telephone 011-52 (998) 884-3827 * 011-52 (998) 884-3306. Lagoon and jungle eco-park including meals, water sports, guided tours, catamaran boats, snorkeling, kayaking, lockers and towels. Open 9 a.m. to 5 p.m. daily. Located 20 miles south of Cancun on the Tulum - Chetumal Highway. Crocodiles, monkeys, snakes, deer, birds and more! Restaurant on-site. Bus transportation from Cancun.